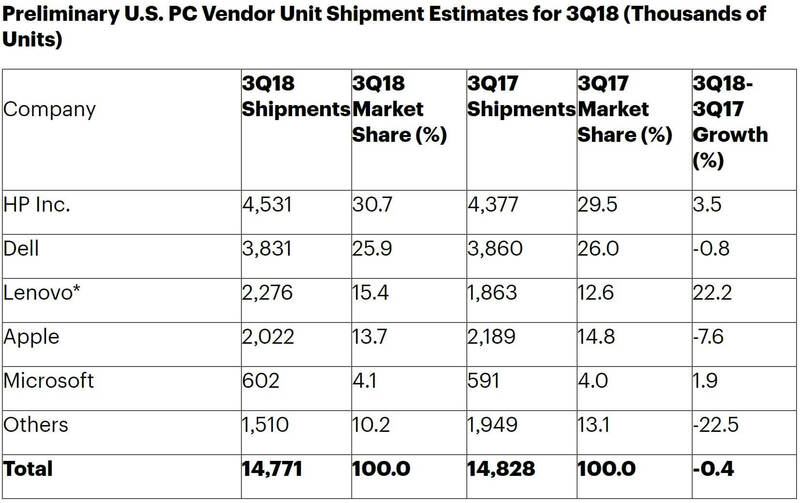 In brief: The PC market had its most successful quarter in six years during Q2, and while growth was flat during the last quarter, it still exceeded expectations. Additionally, Q3 saw Microsoft become one of the top five PC vendors in the US, thanks to its line of Surface products. Research firm Gartner’s figures show that PC shipments grew YoY in the second quarter for the first time since Q1 2012. While Q3 wasn’t quite able to keep the momentum going, shipments did increase, albeit by only 0.1 percent to 67.2 million units. The firm writes that enterprise demand driven by the Windows 10 upgrade cycle is steadily pushing the market in the right direction. It expects upgrade demand to continue until 2020. 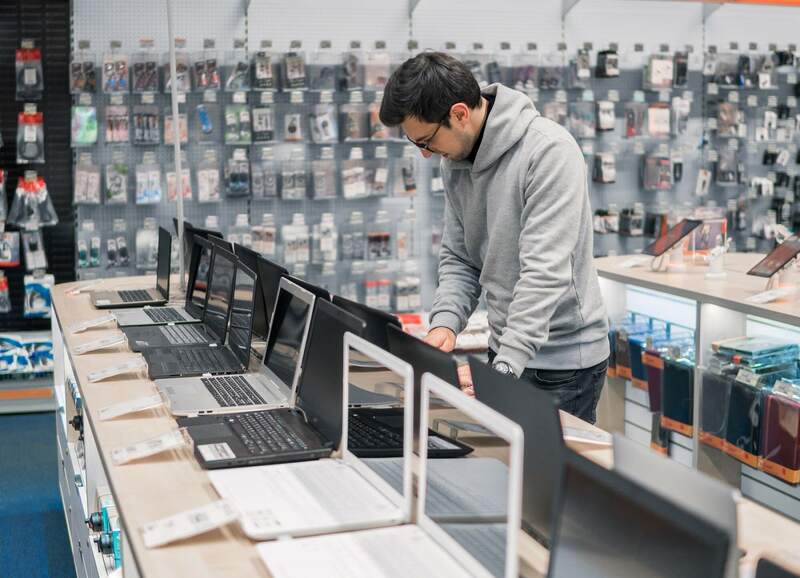 “Despite the third quarter typically showing strong consumer PC sales due to the back-to-school season, weakness in consumer PC demand continued, offsetting the strong sales in the business market,” said Mikako Kitagawa, principal analyst at Gartner. Gartner puts the top six worldwide vendors as: Lenovo, HP Inc, Dell, Apple, Acer, and Asus. The top three firms saw YoY shipments grow in Q3, while the bottom three experienced declines. 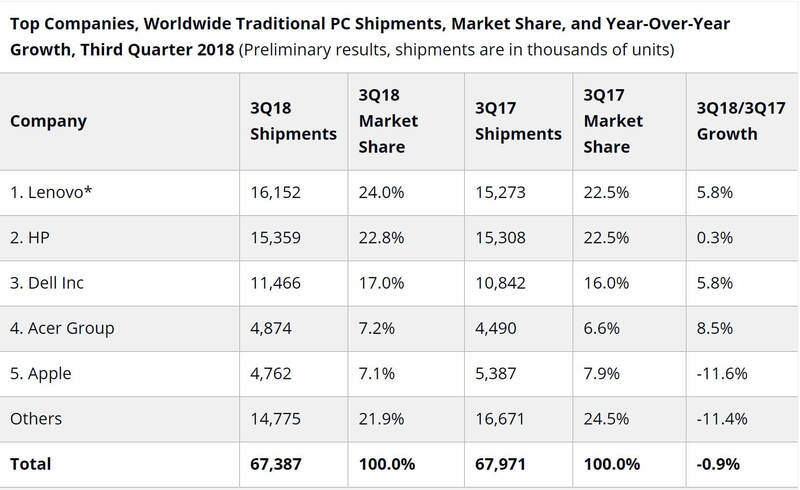 What’s interesting is that in the US breakdown, we see that Microsoft has made its first appearance in the top five, knocking Acer off the table. With new Surface products announced last week and the $399 Surface Go proving popular, expect the Redmond firm to become a regular name in this list. The other big analyst company, IDC, paints a slightly more pessimistic picture of the PC market. It says that shipments fell 0.9 percent last quarter, though that’s still better than many expected. 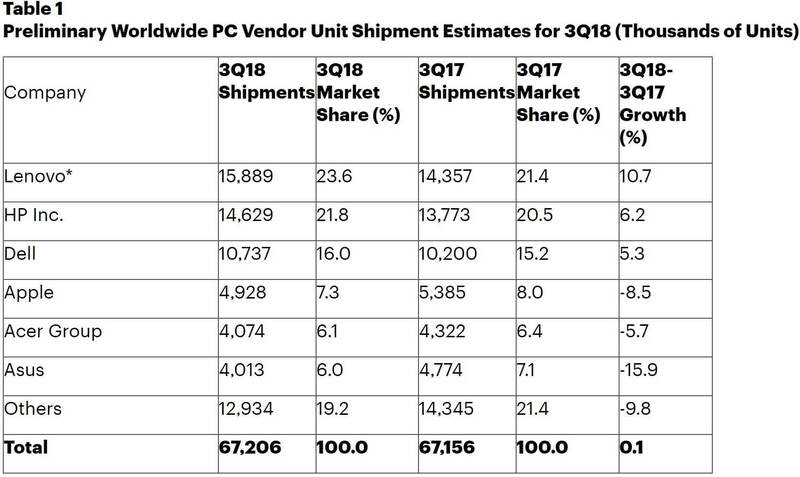 The top five vendors are the same as Gartner’s, apart from Acer and Apple swapping places, which means IDC now places Lenovo in the number one position after HP came out top during Q2. While growth is flat, it’s still encouraging to find that the PC industry appears to have found its footing again after so many years of constant quarterly declines.